Martin Rios of Switzerland delivers the stone. Elise Christie gets her chance to claim an elusive first Olympic medal when she resumes her 500m campaign. After a dazzling performance in the preliminary round, Christie is likely to be challenged by home favourite Minjeong Choi. Snowboard superstar Shaun White makes his Pyeongchang debut in qualifying for the men's half-pipe. White won back-to-back gold medals in Turin and Vancouver but came up short in Sochi and will be looking to regain his Olympic title at the age of 31. 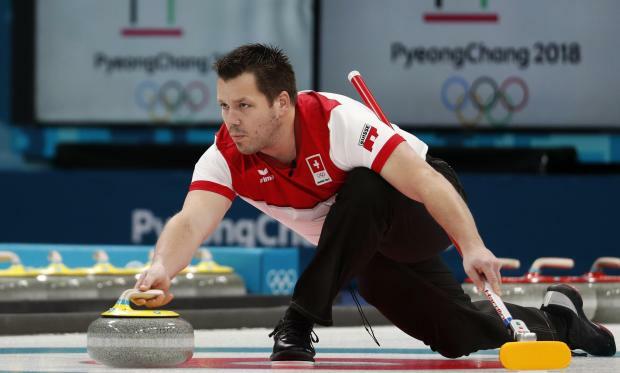 Canada and Switzerland will contest the inaugural mixed doubles gold medal match after seeing off Norway and the Olympic Athletes from Russia in their respective semi-finals. Canada, the game's dominant force, will start as favourites. After Andrew Musgrave's heroics on Sunday, it is the turn of GB team-mate Andrew Young to start his cross-country campaign in the men's 15km classical. Also, in the women's competition, Marit Bjoergen gets the chance to add to her record Olympic medal tally of 11. Austrian great Marcel Hirscher makes his first appearance of the Games in the men's combined. Hirscher has won six world championship titles but only has a silver medal in Sochi to show for his Olympic efforts, and will be challenged by Norway's Kjetil Jansrud.